Offering you a complete choice of products which include laboratory slide carrier, slide staining system, tissue block cabinet, microtome blade, slide staining dish and microtome razor attachment for disposable blade. 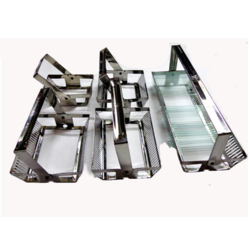 We are the trustworthy enterprise involved in offering optimum quality Laboratory Slide Carrier to our customers. 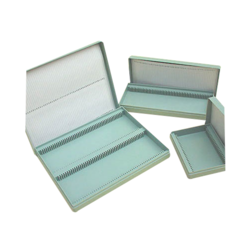 It is compact and durable, this high impact slide Carrier offers the best in microscope slide protection for the histology laboratory. Our professionals use quality tested raw materials and latest techniques in accordance with set industrial norms. Our offered carrier is best known for its sturdy design and premium quality, thus widely deadened in market. 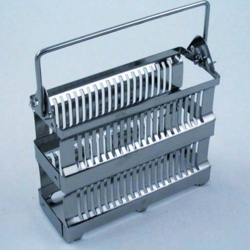 Clients can get this Laboratory Slide Carrier from us at industrial leading prices. The Slide staining system has two components, a square staining jar and a 12-position horizontal slide staining rack. Jars can be loosely joined to each other laterally, ensuring they are kept in the same order when moved around on the lab counter. 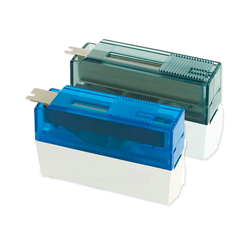 They are available in two different sizes to help identify contents or applications. The staining jar, being made from Stainless Steel 304 grade, will not break. It resists attacks from most staining reagents including alcohol and xylenes but not phenols. The wide base offers greater stability while the inside is recessed, allowing for a smaller reagent volume of only 500ml. Ideal for frozen sections, small jobs and special processes. The lid completely covers the slide staining jar to minimize spills and evaporation. The handle is permanently attached to the rack for easy insertion or removal of the slide. The base of the rack is placed in the horizontal position to ensure the slides are in place, and are rotated sideways for easy slide removal. For keeping blocks embedded in embedding rings/ disposable cassettes. 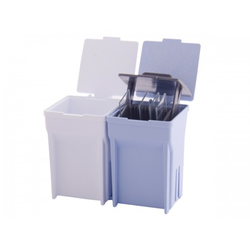 CRC duly powder coated tray are suitable designed to keep the block one after other in rows for easy and quick storage and removal with individual ring no showing on top. 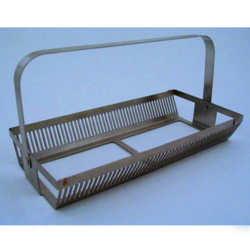 Each tray will accommodate block in rows sliding smoothly in place and can be taken out easily. 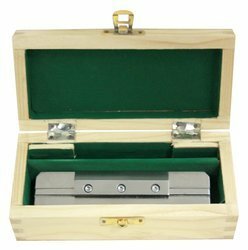 Made of special alloy steel supplied with handle and honing guide in wooden box. Most suitable for WESWOX rotary microtomes. The Western Electric & Scientific Works is Manufacturers and Exporters of WESWOX Brand. The Western Electric & Scientific Works is a Exporter, hospital Instruments Manufacturer and supplier medical instrument & equipments our main market is in More then 55 Countries. Our ingenious professionals and sound production unit help us to manufacture and supply Slide Staining Dish. Packaging Details: packed in good quality packaging. Universal Disposable blade attachment. Most Suitable for Rotary Microtomes. Complete with box. Made from finest quality Stainless Steel. We are an incomparable name in offering a superior quality Low/Med./High Profile Disposable Microtome Blades from brand Leica Feather Duraedge. Capable of sectioning tissue for biopsies in ultra-thin sections, these blades gives you unsurpassed precision in the lab. These blades are manufactured to the highest standards for sharpness, consistency and durability. This product is provided at market leading price within a given time frame in quality packing. These blades are manufactured to the highest standards for sharpness, consistency and durability. Our special proprietary process for hardened stainless steel ensures the quality of each finely honed and polished blade to give you a flaw-free edge. Capable of sectioning tissue for biopsies in ultra-thin sections, these blades givee you unsurpassed precision in the lab. For keeping 75x25mm slide in vertical position one after the other. Made S.S 304 including slide carrying attractive powder coated paint finish. The cabinet has 480 x 75 drawers and takes slides Vertical position. Each drawer moves in a slot and it completely removable for easy lifting of slides. The cabinet accommodates maximum number of slides for optimum space utilization provided with Lock able doors. Block Cabinet Made Of Crc Sheet Duly Powder Coated. The Internal Drawers Are Also Made Of M.s Duly Powder Coated. Each Drawer Having 4 To 8 Compartments With Capacity Of 125 Blocks. Index Card Holder And Handle Are Provided On Each Drawer. Handle Has Been Provided On Front Panel. 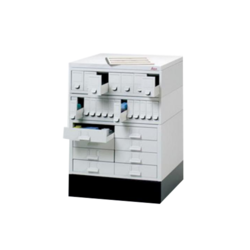 The Cabinet Has Doors For Dust Free Storage And Is Provided With Lock And Key. Weswox Biopsy Embedding Cassette (disposable) As an eminent manufacturer, trade and supplier we offer an extensive range of Biopsy Cassettes that is manufactured by our associated vendors using premium quality raw materials according to the latest market trends. These cassettes are offered in various sizes according to the application requirements of the customers. 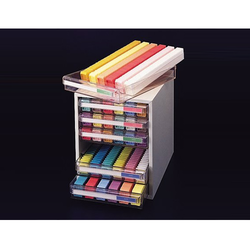 The entire range of Biopsy Cassettes is highly admired for easy handling, perfect dimensions, corrosion impact resistance, perfect finish and durability. Customers can avail these Biopsy Cassettes from us in customized options as per their requirements. With 0.3 mm pore size and a separated compartment with larger holes, our Biopsy Cassette offers fast fluid exchange and reduced flotation. It is easy to open close with same hand. Molded from a specific high-density polymer, our patented cassettes ensure safe specimens submerged in liquid. Also, our Biopsy Cassette is resistant to histological solvents chemical actions. The frontal writing area is set at an angle of 45 degree to make the cassette very suitable for use with automated cassette printers. 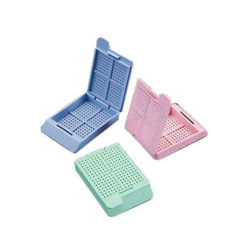 We are offering Microscope Slide Box (100 Slides) For Students. Packaging Details: packed in sturdy box.